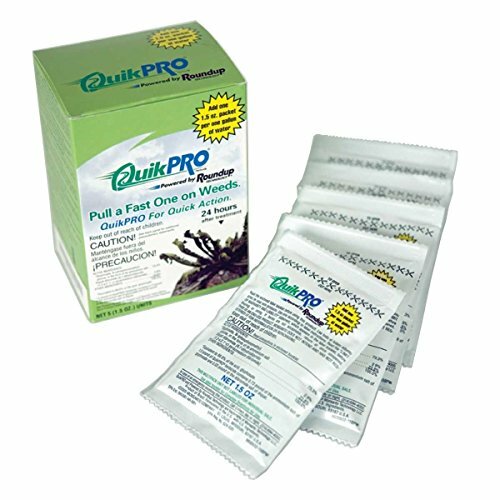 RoundUp Quick Pro from Monsanto combines glyphosate and diquat into one easy to use powder for fast control of tough weeds. It provides systemic post-emergent control of most annual and perennial weeds. The addition of Diquat allows for quicker weed absorption before rain can wash the solution away. Roundup QuickPro Herbicide is for use anywhere there is undesirable vegetation. Extra care should be taken to ensure that non-target vegetation is protected from any drift. The mix rate for Roundup QuikPro is 1.5 ounces per gallon of water.